Hi everyone! 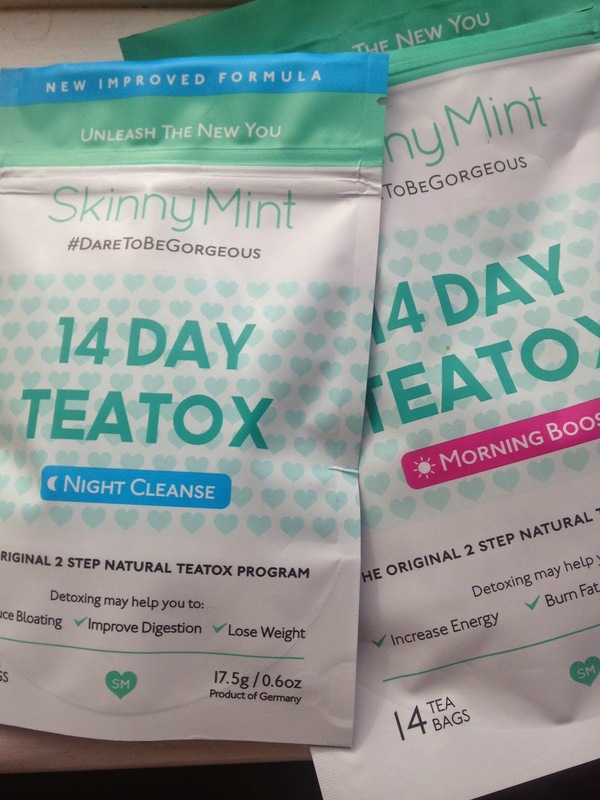 Today I thought I would tell you about something new I'm trying, it is the Skinny Mint Teatox. Now, I have seen recently that a lot of people are trying this or something similar like Bootea so I thought I would see what all the fuss was about and ordered a 14 day starter kit from Skinny Mint. I only ordered the starter kit as I have never done anything like this before, therefore I had no idea how I would get on with it. As I am naturally quite small, I didnt buy these with the intention to loose weight, but as part of my healthy eating and exercise regime that I have tried to keep up recently. It comes with 14 morning boost tea bags (which you obviously take in the morning) and 7 night cleanse tea bags (which you take every other night). The daytime tea bags are to said to help increase energy, burn fat and reduce appetite. I have only been taking these for the last couple of days, so I cannot comment on whether I have seen much of a difference with fat burn, but I have definitely seen an increase in energy throughout the day as I am someone who is always tired and these do make me feel more alert. It has all natural ingredients including.. The night time tea bags are said to help reduce bloating, improve digestion and lose weight. Unlike the day tea bags, you take these every other night after your last meal. It has all natural ingredients including.. The morning tea taste absolutely gorgeous, very fruity and refreshing so if you already enjoy fruit tea, you would 100% love this. The evening tea is a lot more citrus tasting and in my opinion I much prefer the taste of the morning tea. However, it is great after a heavy evening meal to make you feel less uncomfortable and bloated. If you are using a Teatox program at the moment, I would love to know how you are getting on!